For maps, where to stay, ratings, and more tourist information, refer to the Anchorage trip planner . Zurich, Switzerland to Anchorage is an approximately 15.5-hour combination of flight and car. You can also do a combination of train, flight, and car. The time zone difference moving from Central European Time (CET) to Alaska Standard Time (AKST) is minus 10 hours. When traveling from Zurich in July, plan for little chillier days in Anchorage, with highs around 24°C, while nights are about the same with lows around 15°C. On the 10th (Wed), you'll travel to Cooper Landing. Cooper Landing is a census-designated place (CDP) in Kenai Peninsula Borough, Alaska, United States, about 100mi south of Anchorage, at the confluence of Kenai Lake and Kenai River. Your day-by-day itinerary now includes Kenai River Float-n-Fish. Kick off your visit on the 11th (Thu): see what you can catch with Kenai River Float-n-Fish. Plan trip to Cooper Landing with our itinerary maker to find out where to go and what to do. Drive from Anchorage to Cooper Landing in 2 hours. Expect a bit cooler weather when traveling from Anchorage in July: highs in Cooper Landing hover around 20°C, while lows dip to 13°C. On the 11th (Thu), wrap the sightseeing up by early afternoon so you can travel to Homer. Homer is a city located in Kenai Peninsula Borough in the U.S. Kick off your visit on the 12th (Fri): explore the landscape on two wheels at Homer Spit and then admire the masterpieces at Bunnell Street Arts Center. To find reviews, photos, more things to do, and more tourist information, refer to the Homer holiday planner. You can drive from Cooper Landing to Homer in 2.5 hours. In July, plan for daily highs up to 20°C, and evening lows to 12°C. On the 14th (Sun), you'll travel to Soldotna. Soldotna is a city in the Kenai Peninsula Borough, in the U.S. For more things to do, ratings, maps, and other tourist information, you can read our Soldotna day trip planner. Traveling by car from Homer to Soldotna takes 2 hours. In July, daytime highs in Soldotna are 21°C, while nighttime lows are 11°C. On the 16th (Tue), you're off toSeward. For other places to visit, more things to do, where to stay, and more tourist information, go to the Seward trip planner . Traveling by car from Soldotna to Seward takes 2 hours. Expect a daytime high around 20°C in July, and nighttime lows around 13°C. On the 18th (Thu), you'll travel to Whittier. Whittier is a city at the head of the Passage Canal in the U.S. To see reviews, maps, photos, and other tourist information, read our Whittier vacation planning tool . You can drive from Seward to Whittier in 2 hours. Alternatively, you can take a bus; or take a train. In July, plan for daily highs up to 20°C, and evening lows to 10°C. You'll set off for Valdez on the 18th (Thu). Valdez, is a city in Valdez-Cordova Census Area in the U.S. To find traveler tips, more things to do, ratings, and other tourist information, use the Valdez travel itinerary planner . Traveling by combination of bus and flight from Whittier to Valdez takes 4.5 hours. Alternatively, you can ride a ferry. In July, daytime highs in Valdez are 21°C, while nighttime lows are 12°C. You'll set off for Chitina on the 21st (Sun). Chitina is a census-designated place (CDP) in Valdez-Cordova Census Area, Alaska, United States. For reviews, other places to visit, ratings, and tourist information, read Chitina tour itinerary site . Drive from Valdez to Chitina in 2.5 hours. July in Chitina sees daily highs of 23°C and lows of 9°C at night. Finish your sightseeing early on the 23rd (Tue) to allow enough time to travel to Fairbanks. To see photos, more things to do, where to stay, and tourist information, read our Fairbanks trip planner . Traveling by car from Chitina to Fairbanks takes 6 hours. Alternatively, you can fly. Expect a bit warmer evenings in Fairbanks when traveling from Chitina in July, with lows around 14°C. You'll set off for Denali National Park and Preserve on the 25th (Thu). Kick off your visit on the 25th (Thu): take in the awesome beauty at Denali. Here are some ideas for day two: identify plant and animal life at Mc Kinley Park Rd. To see ratings, other places to visit, traveler tips, and more tourist information, you can read our Denali National Park and Preserve itinerary website . Do a combination of bus and flight from Fairbanks to Denali National Park and Preserve in 5 hours. Alternatively, you can do a combination of train and flight; or take a bus. 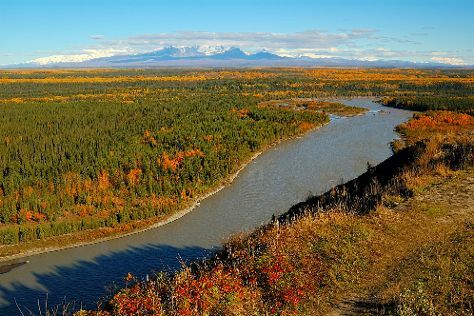 In July in Denali National Park and Preserve, expect temperatures between 24°C during the day and 13°C at night. Finish your sightseeing early on the 27th (Sat) so you can take a train to Talkeetna. Talkeetna is a census-designated place in Matanuska-Susitna Borough, Alaska, United States. To see other places to visit, photos, reviews, and more tourist information, use the Talkeetna route builder site . Take a train from Denali National Park and Preserve to Talkeetna in 4.5 hours. In July, plan for daily highs up to 24°C, and evening lows to 13°C. On the 28th (Sun), you'll travel to Anchorage. For photos, where to stay, other places to visit, and tourist information, read Anchorage trip planning app . Traveling by car from Talkeetna to Anchorage takes 4 hours. Alternatively, you can do a combination of train and car; or do a combination of bus and car. On the 29th (Mon), you're off tohome.